This is a photo of the arena show at the 2005 National Jamboree. The jamboree was held at Ft. A.P. Hill, Virginia. 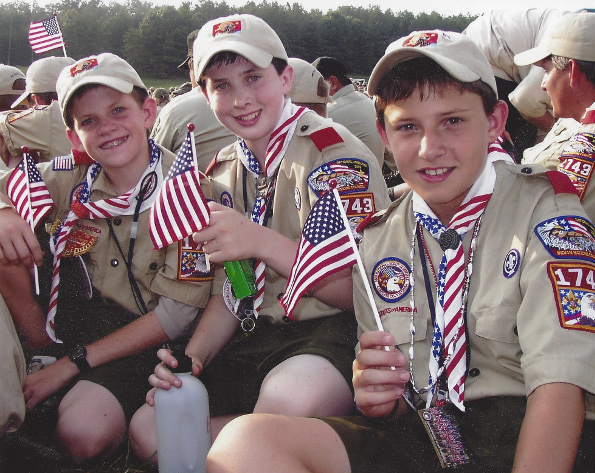 There were 31,700 youth participants, including these three Troop 26 scouts, Evan Hartung, William Eli, and Robert Rusco. They are all grown up now and the jamboree is one of their memories of their childhood. The 2005 National Jamboree was also the site of the infamous “death march”, the scouts and leaders marching to the arena show in extreme heat. This entry was posted in Scoutmaster and tagged Bill's Favorite Photos, Evan Hartung, Robert Rusco, William Eli. Bookmark the permalink.